In 1911, Jack Wain left Burton Grammar School in Bond Street and took up employment with Worthington and Company Limited brewing company. Three years later in 1914 he, together with ex-pupils ‘Chips’ Smedley and Freddie Jefferson, went back to see the Headmaster, which was still Mr Robinson, with the idea of forming an Old Boys Association. The ideas were met with some enthusiasm but the outbreak of World War I caused any plans to be postponed. After the war, Mr Smedley convened a new meeting but many, including Mr Wain, had not yet been demobilised so the response was poor. 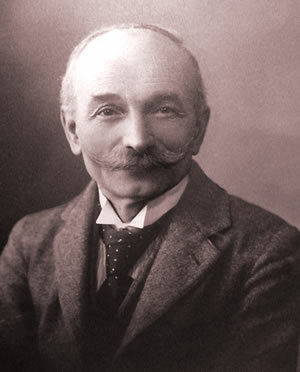 At the end of 1920, Mr R.T. Robinson ( pictured ) was still headmaster and, enthusiastic that an Old Boys Association should be formed, principally to remember the large number of ex-pupils that had fallen in the war, arranged an informal meeting. In 1921, the Old Boys Association was officially founded. Mr Frank Evershed was elected as its first Chairman, Mr A.H. Yeomans was President and Mr H.J. Wain as Honorary Secretary. In 1957, at the time of opening of the new Winshill school, new ties and blazer badges that featured the school crest and the new coat-of-arms was into the OBA Chain of Office worn by the President. After the opening, an OBA celebration dinner was held at Ashfield House on Ashby Road. At the 1958 annual reunion, the first guest of honour was introduced in the guise of Mr R.G. Neill who had been on the teaching staff at Bond Street from 1931 to 1946. Mr Gillion had just been instated as Headmaster and was welcomed and a plaque was dedicated to the late Mr R.T. Robinson who had been Headmaster when the association was founded. In 2004, Richard Wain, son of Jack Wain and himself a pupil at Burton Grammar School from 1944 to 1950, was instated as Honorary Secretary.